The Antrim native will be competing against the illustrious likes of Team Sky this weekend. Jack Wilson features in the Tour of Britain, which gets underway this Sunday. AT 21-YEARS-OLD, Irish cyclist Jack Wilson has already achieved a considerable amount. Having signed for An Post team last year, it was intended that his first season would be primarily about gaining experience and familiarising himself with his surroundings. Nevertheless, Wilson made an immediate impact that caused observers to sit up and take notice, earning plenty of plaudits along the way. His second season, however, has been somewhat less successful — he admits himself he was “back at square one” after some disappointing results. On the back of these slip-ups, Wilson — who is based in Bruggenhout, 40 minutes from Brussels in the An Post team camp — returned home to his native Jordanstown in Antrim to conduct some soul searching and “put in a lot of the hard work”. The youngster tells TheScore.ie that ultimately, this decision paid off, as he returned to the sport rejuvenated, with his results picking up shortly thereafter. In addition to coming fifth in the National Road Race Championships in Ireland earlier this year, Wilson finished fourth overall in Kreizh Breizh Elites stage race in Bretagne, France at the start of August, while the cyclist also took a second-place finish on stage 3, showing his sprinting skills, which he wouldn’t be renowned for. Moreover he finished second overall in the Youth classification. “It wasn’t until August that I started to get my act together and started improving and actually racing the races,” he admits. Yet despite these achievements, this weekend’s Tour of Britain, which features Wilson and fellow Irish rider Ryan Mullen as part of a six-man An Post Chain Reaction Sean Kelly team, will be a different challenge entirely. The event moved up in classification level this year, meaning it’s more competitive than ever, with illustrious opponents from the likes of Team Sky, Movistar, Omega-Pharma and Garmin set to take part. And Wilson admits he is a little nervous about the prospect of facing such big names. “It’s a very hard race. It’s just about survival. I’d maybe try to get a few breakaways, but there’s not much we can do in such a high-quality field. The event has been described as being a little akin to a shop window, with the big teams constantly on the lookout for cycling’s next potential star, and Wilson is keenly aware of its importance. One person who benefited considerably from the Tour of Britain was Wilson’s fellow Irish cyclist and former An Post teammate Sam Bennett. Having won a stage and finished ahead of a rider as talented as Mark Cavendish, Bennett has since gone on to bigger and better things, joining Team NetApp-Endura. Does Wilson consequently look at Bennett as the type of person he should aspire to emulate? “He’s more of a mate than a role model, to be honest, because we lived together and all that, but I do want to be at his level in future,” he says. And finally, there is the inevitable question about doping in cycling. At 21, Wilson is unequivocally part of the post-Armstrong/USADA report generation. Does he consequently truly trust authorities in the sport when they now insist it is completely clean again? 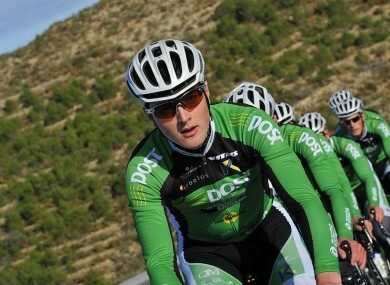 Email “Ireland’s Jack Wilson ready for ‘massive’ Tour of Britain ”. Feedback on “Ireland’s Jack Wilson ready for ‘massive’ Tour of Britain ”.